Institute for Regional Forecasting Director Bill Gilmer gave his economic forecast for 2017 during the Spring 2017 Symposium. To see more from the event, click here. 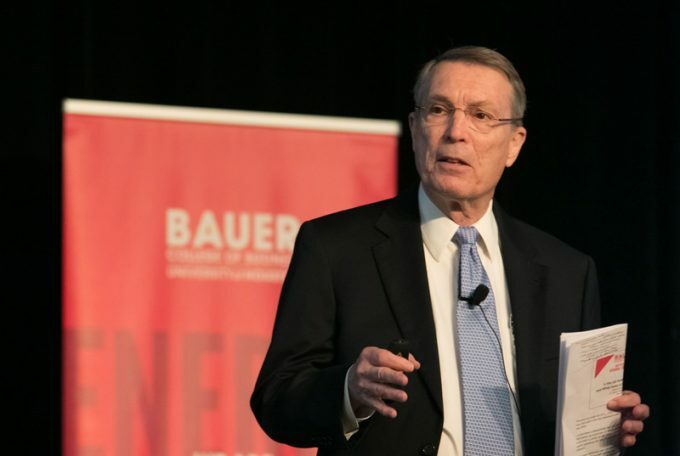 The C. T. Bauer College of Business Institute for Regional Forecasting held its Spring Symposium on May 11, with director and noted economist Robert W. “Bill” Gilmer providing a recap of Houston’s economy in late 2016, as well as his insight on economic prospects for the city in the coming year. The symposium — titled “”Is the Oil Bust Really Over? And What Does It Mean for Houston’s Economic Outlook?” — addressed the progress on oil markets, the U.S. economy and a picture of the local economy for the rest of the year. “This has been tough times for oil, perhaps worse than the 1980’s in terms of an oil bust, but when we turn to the Houston economy, this isn’t the 1980s,” Gilmer said. According to Gilmer, Houston saw very small but positive job growth last year, only adding 18,000 jobs, or a .6 percent growth overall. If overall employment in Houston has been flat, the local oil and gas industry was hit hard by a loss of 77,000 jobs, but is beginning to regain momentum as drilling expands, according to Gilmer. Catch-up growth in many service areas like health care and food service made up the energy losses. The combination of the lost momentum from the oil boom, and the winding down of the petrochemical boom in east Houston, point to a moderate year for growth ahead, perhaps 35,000 jobs, he said, adding that if the pace of expansion in drilling continues were to continue at its current high level, this could reach 55,000 new jobs. Gilmer will share his next set of projections at the Bauer Institute for Regional Forecasting’s Fall Symposium on Nov. 6. For more information on the IRF and Gilmer’s presentation, click here.